Smooth Davidson’s Plum produces soft, fleshy fruits that are high in antioxidants and vitamins. It’s a medium-sized rainforest species native to eastern Australia, though it’s rare to find in the wild as its infertile seeds means it can only be propagated from cuttings or root division. From November to February, this tree blossoms with small pink flowers that later turn into edible purple berries, up to 50mm in diameter, growing in clusters along the stem. They are deliciously sour in flavour and work well in both sweet and savory dishes. They’ve also been known to make a pleasant tasting wine. Fruiting typically occurs between February and May, though mature trees in warmer areas may fruit right through to August. To harvest, give the trunk a firm shake to dislodge any ripe plums, or leave them to drop on their own when they’re ready. This tree grows well in full sun or part shade. When young it can also be grown as an indoor tree, as it needs protection from harsh sun, frosts and winds. This species will tolerate poor soil, but performs best in moist, fertile soil. It is not susceptible to many pests and diseases. Smooth Davidson’s Plum has glossy, hairless leaves that start out red and turn a deep green. It is a medium-sized tropical/subtropical ornamental tree that can grow between 4 and 8 metres in height, with a slender palm-like silhouette, making it a great choice as a central feature or shade tree. My Smooth Davidson’s Plum fruits look deformed or full of holes. What’s going on? Smooth Davidson’s Plum doesn’t suffer from many pests and diseases. Chances are, you’re sharing your fruit with a variety of other hungry creatures like flying foxes, rodents, parrots, worms, moths, caterpillars and fruit flies. Why are the leaves of my Smooth Davidson’s Plum are turning brown/black? 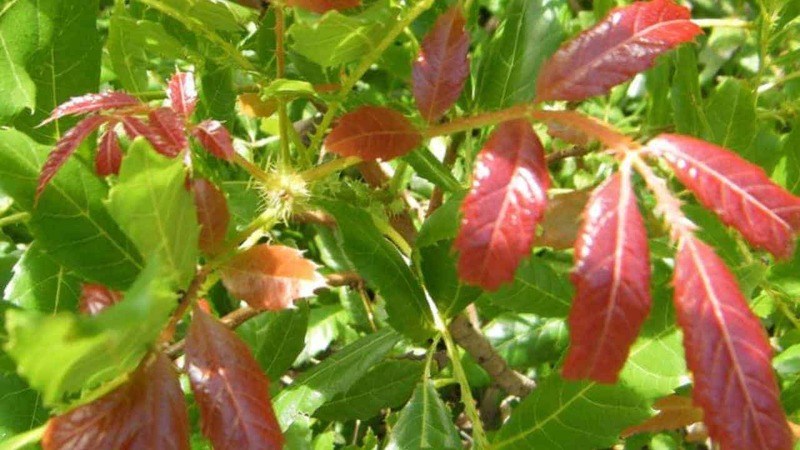 Young trees are prone to leaf burn in hot dry weather, especially if planted in full sun and exposed windy sites. How do I get rid of a fruit fly infestation in my Smooth Davidson’s Plum? Regularly inspect your plant for fruit fly larvae, and set traps around the tree to catch mature insects or use exclusion nets around the fruit.